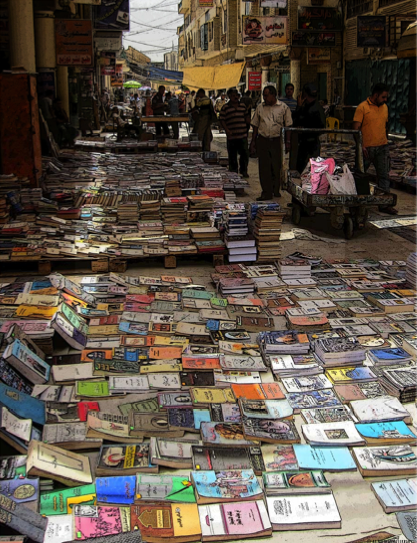 • Iraq’s publishing and bookselling industry has been damaged by decades of war, sanctions and violence. • However, Baghdad’s al-Muthanna Library — a traditional Iraqi publishing and bookselling powerhouse — has just released its first catalog of fiction and non-fiction titles for the international market since the war. BAGHDAD: Founded in 1936, the al-Muthanna Library in Baghdad was a bookselling and publishing powerhouse in Iraq (and in the Arab world) for much of the twentieth century. (Last August, we published a two-part history of the family-owned business and a profile of the Library’s current director, Ibrahim al-Rajab, grandson of the company’s founder, Qasim al-Rajab) In the 1950s and 1960s, in particular, al- Muthanna became a prominent international publisher and distributor of Arabic books, both modern and classic. Al-Muthanna — like much of Iraq’s once-thriving bookselling industry — suffered in the last decades, from the 1980-88 Iran-Iraq War, to the Gulf War, a decade of sanctions, an unexplained fire that burned down the story in 1999, and the chaos and violence in Iraq since 2003. As of last year, there was some uncertainty about how much of their distribution business they could eventually recover. All of the books are Iraqi publications, originally published in Arabic (with some titles in Kurdish and Syriac): given the dire state of Iraqi publishing — last year, Ibrahim al-Rajab estimated that only 300 books were being published in Iraq annually — this catalogue represents a good chunk of current Iraqi publishing: from nonfiction titles such as Adwaa ala sariqat al-mathaf al-iraqi (Spotlight on the Theft of the Iraqi Museum), by Hamid Muhammad Hassan al-Diraji, to recent novels, such as Dhakira medina munqarida (Memory of an Extinct City), by Zuhdi Dawudi, or Taht samaa al-qutb (Under the Polar Sky) by Yusuf Abu al-Fawz. You can download a copy of the al-Muthanna catalog and get a sense of just how far the publishing industry there has progressed since the war. DISCUSS: Is the Gulf Becoming Too Westernized?